Fall and all of it’s splendor will soon be here! Many of our friends will enjoy the fall colors, cool temperatures, and maybe even a hunt for the elusive big buck! So, Atlas Signs and Plaques is taking this opportunity to celebrate the change in season by introducing a new plaque. And, of course, giving it away. 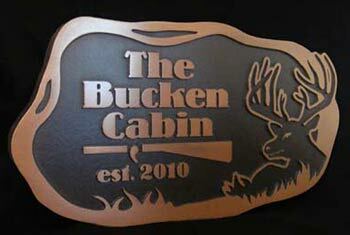 The “Bucken Cabin” plaque is not meant to be offensive which is proven by the graphic of a big buck. So just have a little fun with the play on words and enter the Bucken Cabin Blog Giveaway. This is the great addition you have been searching for to hang on the old hunting shack or designer deep woods cabin. It could also add a little class to you deer blind or tree stand, and make it feel more like home! THE PRIZE: Atlas is giving away a Bucken Cabin Plaque in our Copper Patina Finish. You get one entry just by leaving a comment on this blog post after window shopping the Phrase Crazy Category and helping us out by telling us your favorite. Announce this Blog Giveaway on your Facebook page and let us know by commenting it below. Announce this Blog Giveaway on Twitter and leave a comment below. Be or become a follower of this blog by subscribing to our RSS feed and leave a comment below. Announce this Giveaway on your blog and leave a comment below with the link so all our viewers can visit. Please be sure to list each entry in a separate comment below so you can receive a chance for each. Contest Dates: Begins now and ends on September 14th, 2010 at 12:00 noon CST. The winner will be announced on September 15th. We use a random drawing to select a winner, and get your free prize out to you real fast! There are no catches or tricks. Leave a valid email address on each of your entry comment(s). We will not share, sell, or giveaway your information. Open to residents of the US only. This entry was posted in NEW - Be in the KNOW and tagged buck, cabin, contest, Free, Giveaway, New, plaque, sign on September 7, 2010 by AtlasSigns. Thanks to all who entered our Giveaway! The contest is closed. We will post the winning name tomorrow. I get your feed on Google Reader. I love the Rectangular Skull and Crossbones No Soliciting Sign! What a clever way to say No Solicitors! Thanks for the op to win. I love anything (sign etc) with interesting words. The Keep Calm and Carry On Plaque is really lovely. I like the stickley phrase plaque and I would have it say ‘please remove your shoes.’ But these are all really nice and look like high quality. I really like the handsaw plaque! I love all of the man cave signs. But the giveaway is my favorite! I *love* the ‘No Kidding No Solicitors’ sign with the skull… Maybe with one of those at my front door, the peddlers would finally get the message? Do you offer additional / optional images – like a bulldog (or breed of choice) or .357 Magnum? I love the Harmomy Peace sign. It would go perfect with my daughter’s decor in her room! I just love the Carved Initials Hanging Tree Plaque!! It’s a perfect wedding gift!